This all gets my interest on several levels. First of all, this camera can shoot resolution qualities (although with a few limitations) comparable to what I’m shooting with my $6,000 camera. Not better or the same, but comparable. And the camera is retailing for $1,000. I’m starting to see the more charlatan camera places offering this camera for $700, which means the bargain rate is probably around $900, and the camera’s only been out a short time. Second of all, this thing is tiny. It is just a little bigger than a couple packs of cigarettes. But it shoots in high definition. Third of all, the camera companies are all trying to out-do each other in this area, so this is not likely to be the last we see of these tiny-footprint, HD-shooting cameras, along with probably one or two better features than this one. Here’s the thing. The disarming aspect of this camera is how tiny it is. It’s so small, you can easily forget it’s there. When I shoot interviews for my stuff, people know full well there’s a camera there; it’s that crazy huge thing next to my head, taking down every word. When the camera looks like a walkie-talkie strapped to a watch, it’s many times more disarming than a regular video camera, yet it takes a perfectly great image. The quality of interviews is likely to go way up as a result. Also, it packs light, meaning you can go more places and travel quicker, and carry it into odd situations and be a little less worried about being separated from “the action”. Stuff you capture will be something like HD quality, enough for the vast majority of people. The moments captured, when they’re captured this way, will be that much more definitive and that much more intense. I think we’re going to see some pretty darn good student films out of this, and some pretty amazing documentaries, and maybe even some cool fiction movies as well. I’m in a big way about people not having to beg through a pile of gatekeepers to shoot what they want and how they want, and this is going to help that in a major way. There will be this special, cool time for the next couple of years when people will not realize that cameras this tiny and unassuming are actually creating footage better than anything in the history of television before HDTV. We’re going to see some interesting situations because of it. I can’t wait. I am co-producing a documentary starting next year, it looks like. I suspect it’ll be shot on this camera or an equivalent, for all these reasons. Hooray for progress! That price is unbelievable. Not long ago I paid a little more than half that ($500 + tax) for a decent digital camcorder. 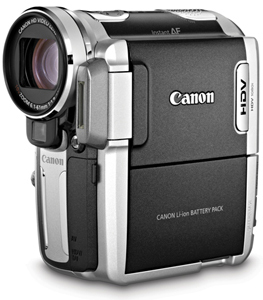 We’re all going to be forced to upgrade to HD sooner or later, and the HV10’s price will ease that transition.